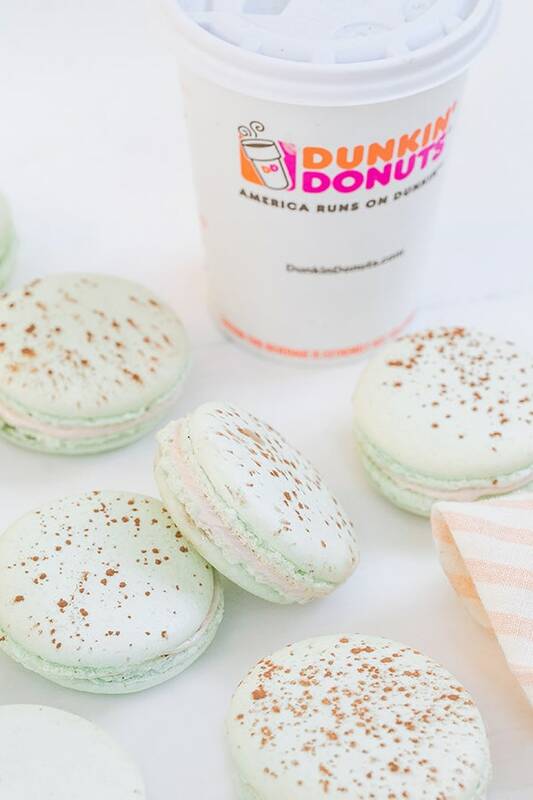 Dunkin’ Donuts has finally made their way out west and we’re thoroughly enjoying the goodness that Dunkin’ is! Since Zan was born and raised in New Jersey, we’ve had our fair share of Dunkin’ Donuts when visiting his family on the East Coast. He’s more than happy now that there’s one fairly close to our house, as it brings back some nostalgic memories! 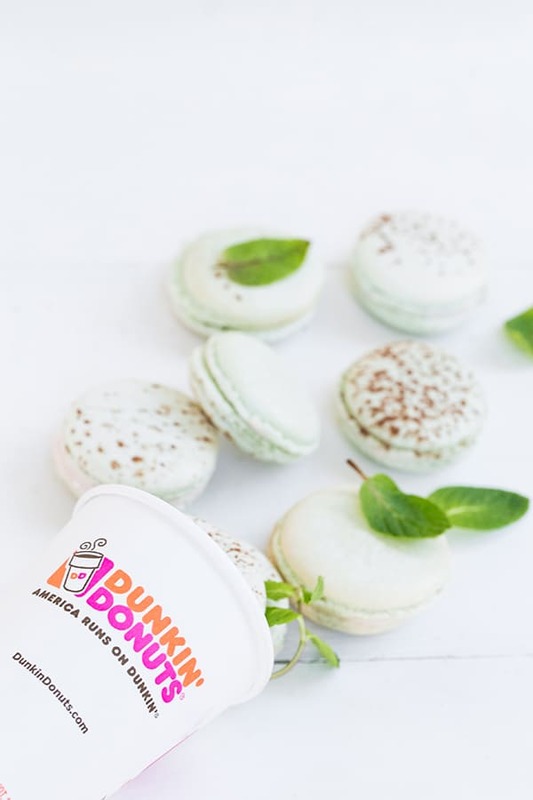 So to celebrate Dunkin’ Donuts and to give you all a mid-winter pick-me-up, we created a twist on their Mint Hot Chocolate and made homemade mint macarons with a hot chocolate marshmallow fluff filling!! 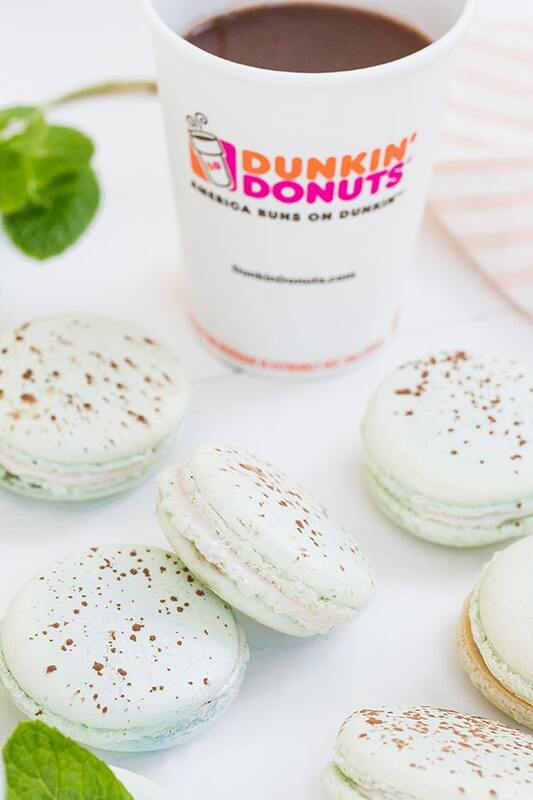 What’s not to love about a cup of rich, hot chocolate paired with a delicious French macaron?! There’s always been a slight fear of making a macaron, but it’s actually a lot easier than it looks. 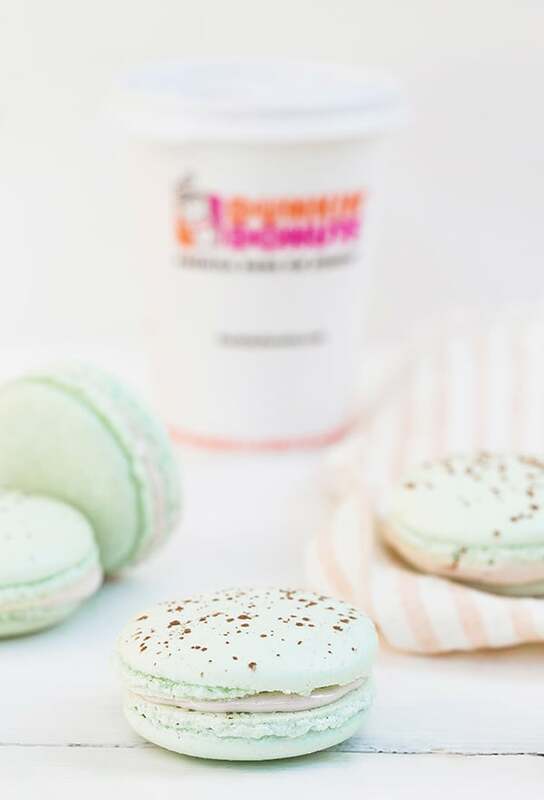 This macaron recipe has an amazing mint flavor, crispy outside and chewy center and the hot chocolate, marshmallow fluff filling has the perfect amount of sweetness! This is such a unique way to incorporate hot chocolate into a dessert and we know you’re going to love these little treats!!! Place a large sieve over a bowl and pour flour and powdered sugar into the sieve. Using a rubber spatula, press the almond flour and sugar down through the sieve. You can discard any larger lumps of almond flour. Using an electric mixer, beat the egg whites and cream of tartar on medium until frothy. Add in the sugar and beat until stiff and shiny. Transfer the egg whites to the almond mixture and fold in. It will take some time to mix it all together, but do it by folding and turning the bowl. Add in the food coloring and mint extract, and continue folding until everything is mixed together. Preheat the oven to 290 degrees and prepare a cookie sheet with a silicone baking mat. Place the batter into a pastry bag with a 1/2 inch round tip. Pipe round circles about 1 1/4” wide onto the silicone baking mat, about 15 per sheet. Firmly tap the baking sheet on the counter 3 times to release any air bubbles. Let the cookies sit room temperature until they’re no longer sticky. Could be anywhere from 165 to 30 minutes. Then bake for 15 minutes and let them cool before removing. In an electric mixer with whisk attachment, beat egg whites and cream of tartar together until light and frothy. Slowly add in the 2 tablespoons of sugar and beat until soft peaks form. In a small saucepan, combine 1/3 cup Dunkin’ Donuts Mint Hot Chocolate, corn syrup and remaining 2/3 cups sugar. Place over medium heat and cook until boiling. Cook and stir until mixture has been boiling for about 6 minutes or until it reaches 248 degrees on a candy thermometer (this is very important in creating a stiff texture at the end!). Remove from the heat. With the mixer on low, slowly add the syrup mixture to the egg whites. Increase mixture speed to high and continue beating for 5 minutes. Add in the mint and beat for another minute until mixture looks like marshmallow cream. 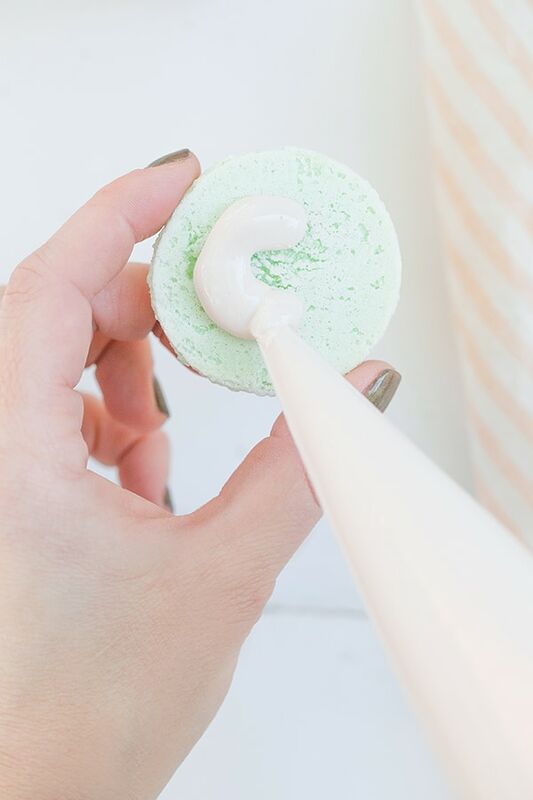 If your cream does not get stiff enough, place in the fridge until it’s hard enough to pipe onto the center of the macarons. 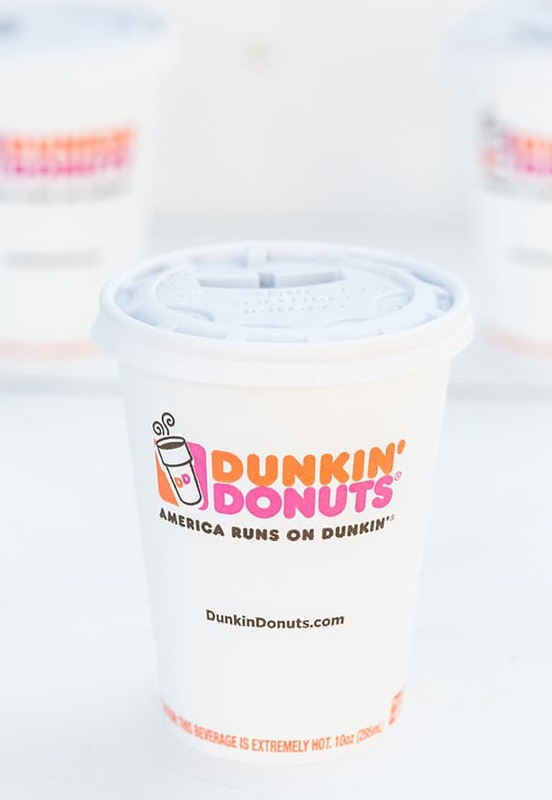 Thanks Dunkin’ Donuts for partnering with us! Thanks Gabriella!!! I LOVE making macarons now, they’re SO fun and pretty easy!! WOW!! Those are so so pretty. 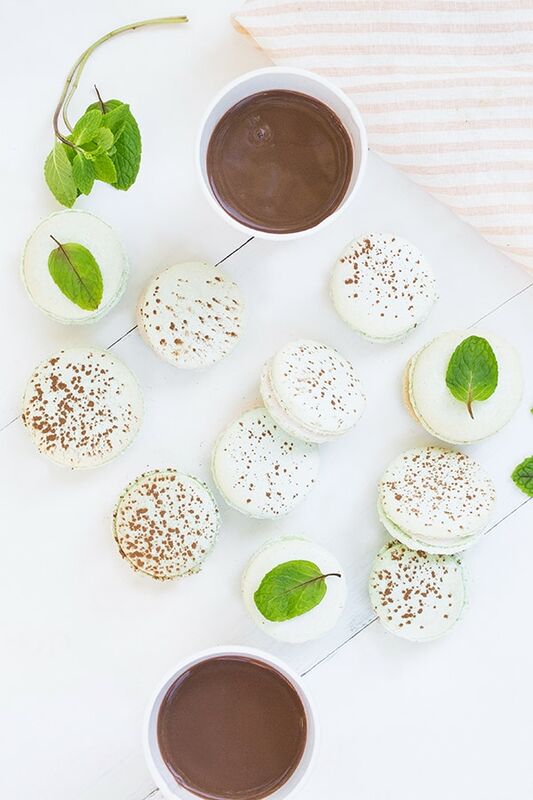 I love macarons and can’t wait to try these mint hot chocolate ones. These are gorgeous and I absolutely can not wait to try this recipe! I’ve been dying to try the art of macaroon making, and I think these have pushed me to try! They sound delicious!